After the long holiday season and all the rich food that goes with it, one longs for the simpler things in life. Food that doesn’t require a French to English dictionary to make. Food that all Filipinos can relate to. The much under-appreciated and unacknowledged Pinoy cuisine. But when you are too lazy to cook at home or have guests who are clamouring to try something local, where do you go to tuck into some home-grown food? Ten Titas, especially when they get creative. Especially with their pork dishes, like the peking duck style pata and the osso buco caldereta. Oh, the chinese ham carbonara works too. Recipes, the gising-gising and the crispy pla-pla, in particular. Hmmm, perhaps Sentro, para he/she won’t be so scared! Haha. Or one of those grill places (Gerry’s, Dencio’s, I’m trying to remember the name of that place in Alabang, also with a branch at a driving range in one of the military camps…). I’m not big on the Pinoy food–I prefer the fried dishes like lechon kawali and crispy pata over sauce-y stuff like kare-kare. So any place that does a mean crispy pata, and crispy sisig (without drying it out) is enough to make me happy. :) My all-time favorite dish is adobo, but I generally just have that at home. Nothing beats homecooked adobo! If not a meal at my house (I know that’s a cliché), I like taking foreign visitors to Ebun in Greenbelt 3. They like the hip Filipino décor yet it makes them feel like they’re going local. The food is inexpensive and good, especially if you order the right things (such as sigarilyas in gata, kilawin, crispy pata, and smoked talong with bagoong). My brother and his chef friend like going there after the lunch service. Maybe the kapampangan food has something to do with it. Here’s my super generalization: for foreign guests I think what’s more important than the restaurant is ordering food with flavors or cooking styles that they like. Unlike Thai food where most westerners like noodles, chili, lime, basil, curries, etc., I think Pinoy food has fewer flavors or cooking styles that they enjoy. Maybe that has something to do with the lack of success of Filipino cuisine abroad. Most of my guests like dishes in coconut milk, any grilled or barbecued meat, most green vegetables (like kangkong) if simply prepared, crispy pata, lumpiang shanghai and ubod, and any “ceviche’d” fish to cut the fat. What they seem to like less are thick stews (kare-kare and kaldereta), vinegary stews (paksiw), fear factor meats (although people seem to like lengua if they can get over the initial reaction), sour soups (sinigang), and anything too sweet. Aling Lucing’s or Trellis – if my guest is adventurous enough to try the sisig!!! Just so they have different takes on the way Pinoy food is made — from lutong bahay to daily fare to special occasions to fusion. That’s a toughie. Pinoy food is so subjective. I don’t think any single restaurant would fit the bill. I think I would take them to Sentro, Cafe Adriatico (not totally Pinoy but their Pinoy food, especially adobo ni aling ising is bomb-diggety), Chef Laudico’s, Via Mare and then maybe some street food. And the fresh piyaya in Salcedo Market. And Tita Cely’s Bicol Express. And sisig! And Chicken Inasal! I wouldn’t want to plunk someone down in from of a plate and say…this is pinoy food. I want to paint a picture…where we are, where we are going, where we can go…past, present, future. Filipino food is just as much Laudico’s fusion’d creations as it is a down-home adobo, or your lola’s sinigang, or your fave merienda in Via Mare, or eating isaw off the street. It is all of this and more. I wrote an article on this – here. And, as I forgot Sentro as you pointed out, I wrote another article including this lovely resto here. What I failed to mention na dapat matikman – squid balls, balut, barbecue from the sidewalk, green mango from the sidewalk, halo halo ng Razons, chicharon na full back fat, dried mangoes from Cebu, yema, kaong (most of the bottled goodies you can find in fiesta market in market market), and goto! Bangus for Crispy pata(i know, i know, why would you order Crispy pata in a resto named after a fish). Anyway, their crispy pata is very good and their sauce is different, then you can have the bangus skin chicaron as appetizer, and the different bangus recipe. 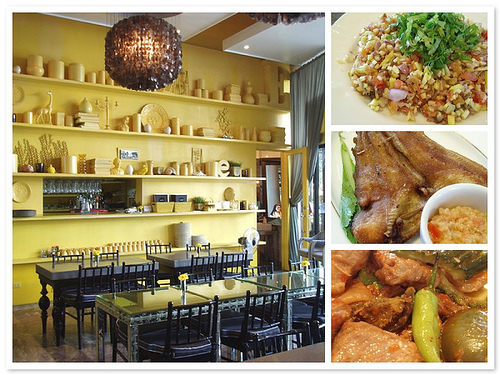 Lola Maria in Pioneer Street, visit my blog and look at my review, they also have excellent sinigang. Bistro Remedios, Abe, Sentro 1771 or O Kitchen in Libis. If he eats a lot, Kamayan’s buffet. Mangan — if you don’t mind malls that is. Simple setting, mid-price, but food tastes like it came from our own (Capampangan) home kitchen. Have them try the steamed vegetables with a selection of dips (usually paired with grilled fish). I hope it still looks like the veggies grew from the ginormous plate. For me that’s a refreshing visual treat. Siguro it will also depend on the “stature” of the guests. In Manila — maybe Cafe Juanita, Larry Cruz’s Abe, Bistro Remedios, etc. I miss Afrodisia on Annapolis Greenhills, also Larry Cruz’s (this one used to be my favorite, same reason for Mangan, albeit it was pricier, tribal/somewhat polynesian interior). Or perhaps take them to an exotic island/very tropical destination like Palawan and let them try the grilled seafood and kinilaw there. I like Ka Lui in Puerto Princesa. More about Ka Lui here. Truth is, whenever my family and I have foreign guests and want to impress, we usually invite them to our home and cook for them. Many thanks to A. for the lovely interior shot of Ebun. margaux, oo nga -- our streetfood could just be the ultimate pinoy food experience! i like ebun too (also with mangan resto group). another great read, franco! I also just wanted to say I love the angle of your blog and that all three of you are coming to the table with different perspectives. Makes for great reading! add Pancake House's adobo sulipan! :D yummy! I have not been to Bistro Remedios in years. Maybe it's time for a return visit. Thanks for helping out. This post is only as good as the people who write back and contribute. We are curious. Will email soon. Interesting. I have not really eaten adobo at Pancake House. I think I'll try it. :) But really it's hard to beat the home-made version. great entry! i've been trying to learn more about Filipino food the last year or so and it has been a very interesting journey. I'm planning to go back to the Philippines this year to get more in tuned with it. This entry has been a great help to see what the restaurant scene is like. I'll definitely check out some of your restaurant picks. i'll def be checking future entries!